Paddle Pad: SDCKT is proud to have Greg Crouse as a member!! Greg Crouse, 44, of Fullerton, Calif., a PossAbilities member for the last four years and who is on track to compete in the 2016 Paralympics as part of PossAbilities’ “Road to Rio” program, won his qualifying event to make it to the team. A member of the Loma Linda University Team PossAbilities has secured a spot on the USA Canoe/Kayak National Team, and will represent the country at the ParaSprint World Championships in Duinsburg, Germany next month. The 2013 National Team Trials were held this month in Lake Placid, New York, on the flat waters of Mirror Lake. Crouse competed alongside fellow paddlers, both juniors and seniors, and won his 200-meter event with a time of 58.07 seconds, which is 2.01 seconds faster than his last year’s qualifying time. The victory marks the third time that Crouse will represent the United States at the World Championships, out of four attempts at making the team. “I am just honored and proud to be able to serve the United States in this capacity,” said Crouse, a retired Army veteran who, in 1988, lost his left leg after a drunken driver struck him while he was walking. He joined PossAbilities after hearing about the organization from a friend, and credits the organization for helping and motivating him to become an elite athlete. PossAbilities is a community outreach program developed by Loma Linda University Center East Campus and supported by founding partner, the San Manuel Band of Mission Indians. PossAbilities’ goal is to offer physically challenged people born with or have permanent physical injury a sense of community by offering activities and practical help. The group has sponsored Crouse in his athletic pursuits, and provided him with a V-1 Rudderless canoe, which allowed him to maximize his training and compete in more races. He is also part of the organization’s “Road to Rio” program, which supports athletes who have the potential to compete in the 2016 Paralympics in Rio de Janeiro. To learn more about the “Road to Rio,” go to http://www.teampossabilities.org/paralympic-program . “PossAbilities has allowed me to be the best that I can be,” Crouse said. 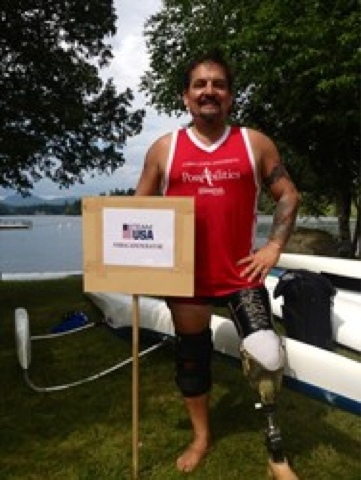 Photo Caption: Loma Linda University Team PossAbilities member Greg Crouse credits PossAbilities for his success, including recently earning a spot on the USA Canoe/Kayak National Team.